eCite - Improving glycaemic control in children and adolescents: which aspects of therapy really matter? In paediatric diabetes, the concept of intensive therapy in the post-Diabetes Control and Complications Trial period has become subverted by a pharmaco-technological paradigm at the expense of other aspects of care such as goal-setting and psychosocial support. This review examines which patients benefit most from intensive therapy in terms of glycaemic control (HbA 1c). It also reviews published controlled trial and observational data relating to the impact of various insulin types and delivery systems on glycaemic control and canvasses the literature dealing with the impact of patient support, philosophy of care, goal setting and treating team dynamic on HbA1c. 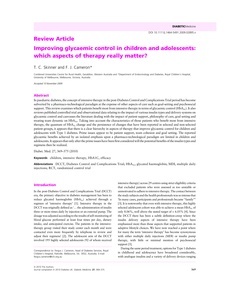 Taking into account the characteristics of those patients who benefit most from intensive therapy, the quantum of HbA1c change and the persistence of changes that have been reported in selected and non-selected patient groups, it appears that there is a clear hierarchy in aspects of therapy that improve glycaemic control for children and adolescents with Type 1 diabetes. Prime issues appear to be patient support, team cohesion and goal setting. The reported glycaemic benefits achieved by an isolated emphasis upon a pharmaco-technological paradigm are limited in children and adolescents. It appears that only after the prime issues have been first considered will the potential benefits of the insulin types and regimens then be realized. © 2010 Diabetes UK.